Anyone else getting shocking peak speeds via Entanet/Freeola? During the day can get >6meg but in the evening <1meg ? I think the spread rules out my kit and line. Its getting to be a pain in the ***. Do you think this is the case with you? My Broadband Ping Live! - As we type! I'm fairly sure this won't be related to Entanet. Freeola, like a few partners, manage their own bandwidth levels. Entanet peak is daytimes, not evenings. I presume Freeola's pipe is getting busy at night. All seems good for me on Freeola. Unless somethings changed (that I'm not aware of) then your connections capacity is still down to the usage of the IPSC/WBC node you are connected to. Check your node's usage and see if it matches your bad throughput. I take it you've also monitored your line's connection (sync/errors) to ensure it's not having a problem during the evening? I presume Freeola's pipe is getting busy at night. 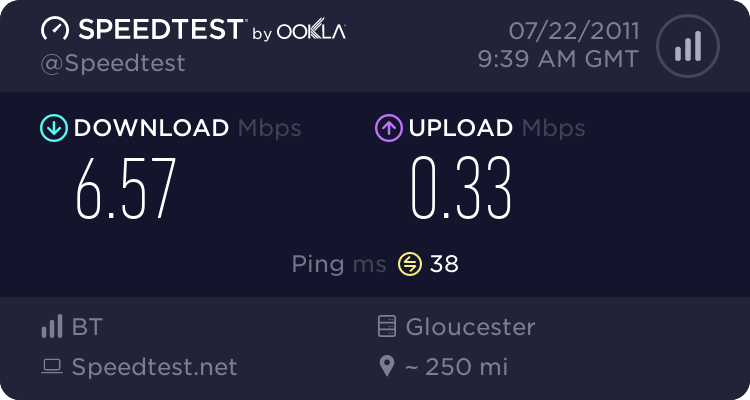 My speeds are all over the place at the monent but Im pretty sure that is down to the yellow VP status of my exchnage - I even managed a 0Kbps BT spoeedtest one evening recently thats from a line that should top 5 megs easily. VP status Yellow - About time BTw rewarded us for our over priced 8 meg crawl with some investment! There has been a general belief between many Entanet partners and other ISPs that Freeola are L2TP based. If they were an L2TP provider wouldn't users see a difference in their tracert results? Yup still the same. No L2TP for us. Have you contacted our support yet so they can take a look?